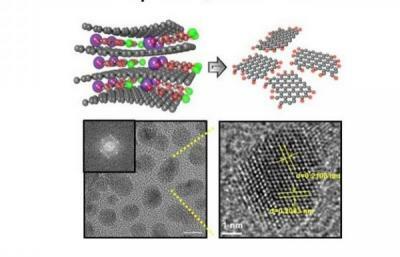 Researchers from the Korean's KAIST institute developed a new process to produce graphene quantum dots that are equal in size and highly efficient in emitting light. Quantum Dots potentially can be used to develop emissive flexible displays (similar to OLED displays), and this development may enable those displays to be graphene-based. The process involves mixing salt, water and graphite and then synthesizing a chemical compound between layers of graphite. All the resulting quantum dots were 5 nanometer in diameter, and these QDs do not contain and heavy metals (like current commercial quantum dots). The process is reportedly easy to scale and should not be expensive. The researchers say that those gQDs could be used to develop LEDs that have a brightness of over 1000cd/m2. This is less efficient than current LEDs, but the researchers hope this technology can be further improved.